--> warna hitam / It's black color. --> warna coklat, dan warnanya terlihat natural dimata, ga terlalu berglitter dibandingkan warna lainnya. It's brown color, looks natural and don't have much glitter in it. --> ini warna kebiruan dan ga terlalu berglitter dibandingkan warna lainnya. sky blue colo and not too glittery like others. --> warna peach agak keemasan / peachy and golden color. --> warna silver agak keabu2an warnanya. / silver color a bit greyish. 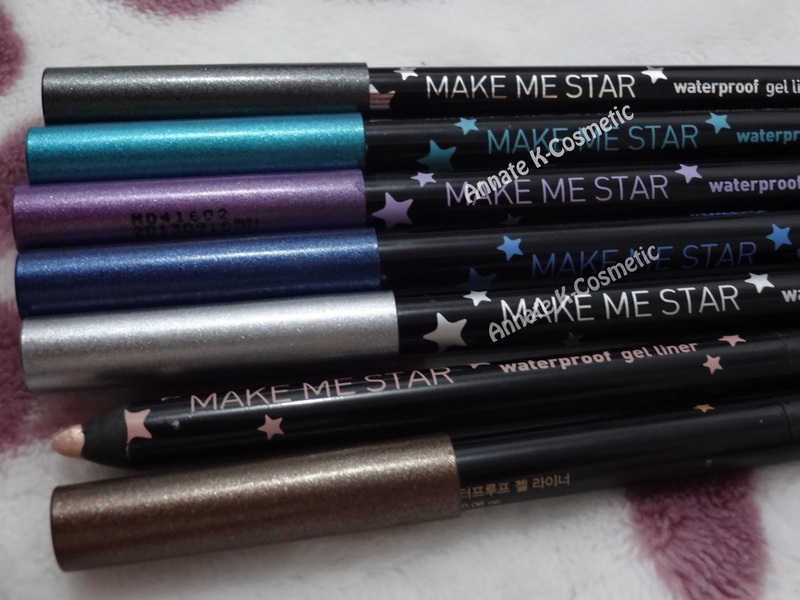 *semua eyeliner ini sedikit berglitter. / note: all of this eyeliner are glittery. 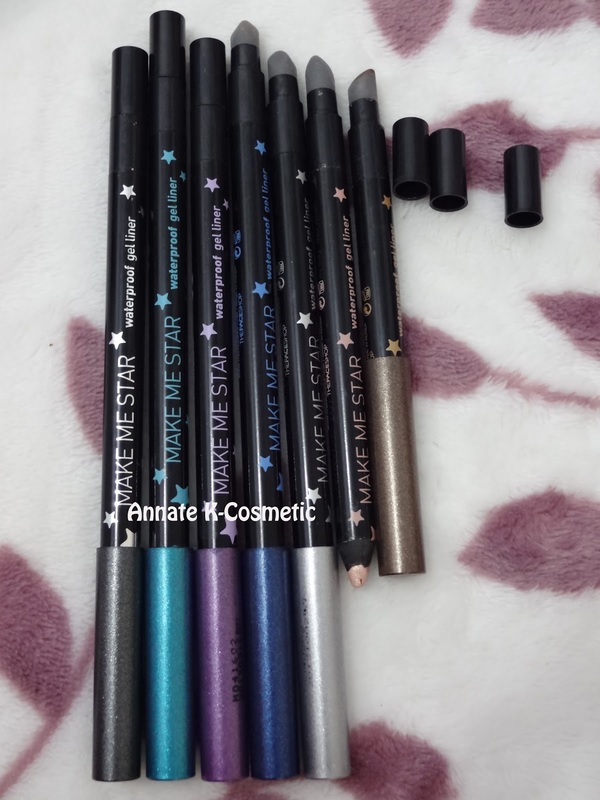 Desain eyeliner ini dilengkapi dengan gambar bintang2 dan tulisan berwarna-warni sesuai warna eyelinernya. Dan dibagian tutup diwarnai sesuai dengan warna eyeliner. The eyeliner design is full of star and colorful word printing as same as the eyeliner color. 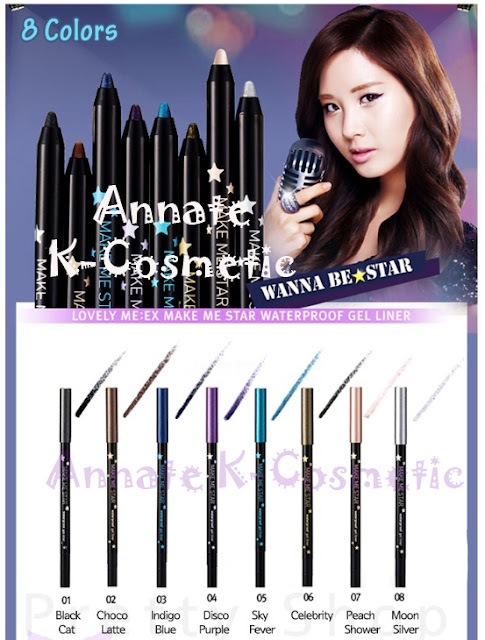 The eyeliner cap also colored which represent the real eyeliner color. 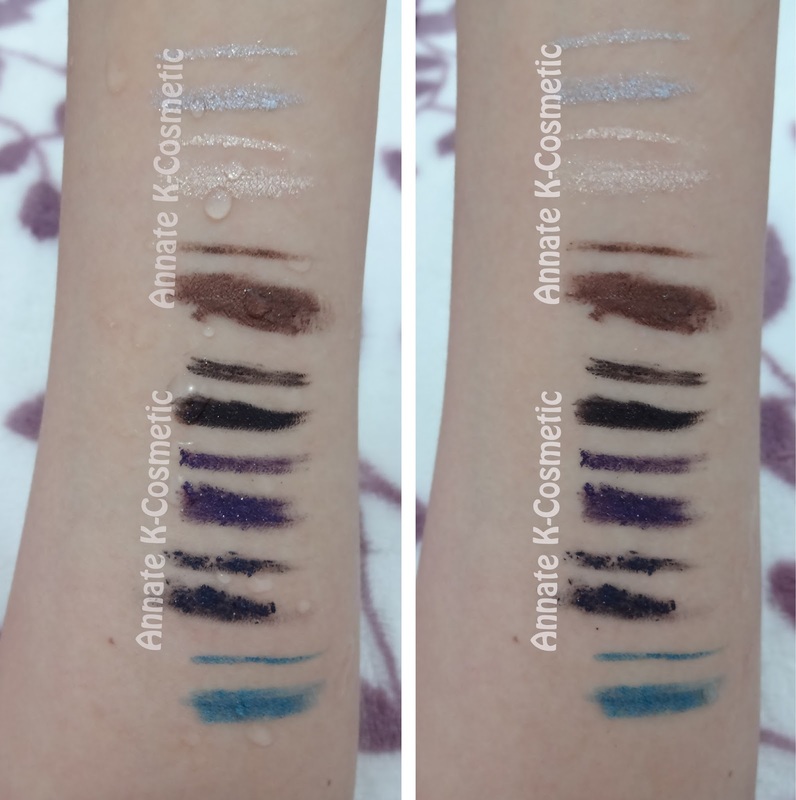 Dibagian ujungnya kalau tutupnya dibuka, akan ada smudger yang fungsinya untuk membaur eyeliner jadi lebih rapi dan terlihat lebih natural. Bahannya seperti karet penghapus. Eyeliner ini ga dilengkapi dengan peruncing. At the eyeliner tip, you'll find the smudger. This smudger is used to blending the eyeliner so it would looks more natural and neat. The smudger itself is like an eraser type. This eyeliner isn't come with a sharpener. It's my collection. I apply thinly and thickly in the picture above. 8. Moon Silver, 7. Peach Shower, 2. Choco Latte, 1. Black Cat, 4. Disco Purple, 3. Indigo Blue, 5. Sky Fever. Eyeliner ini ga begitu smooth waktu diaplikasikan. 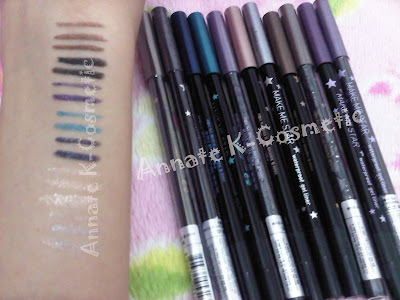 Walaupun begitu, eyeliner ini warnanya pigmented. This eyeliner isn't smooth when applied. Even so, this eyeliner is pigmented. Here, i do waterproof test. 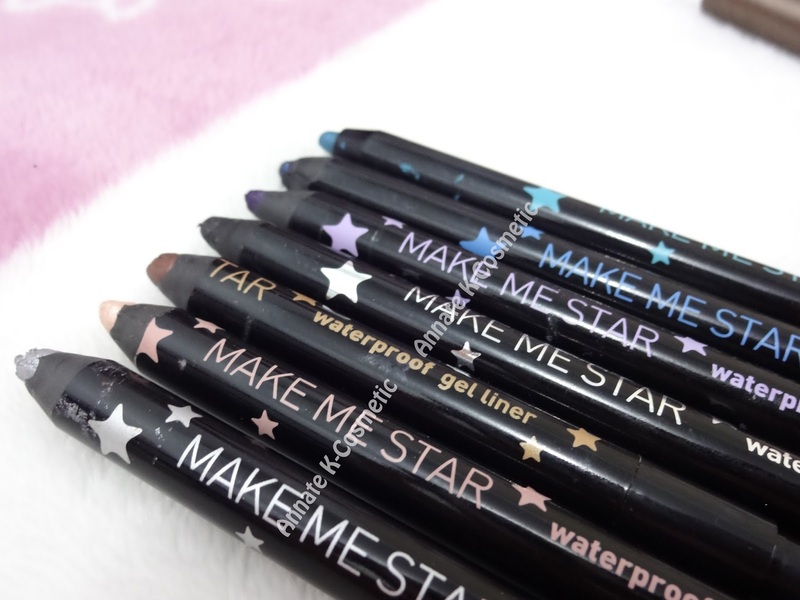 I want to know if this eyeliner are really waterproof or not. 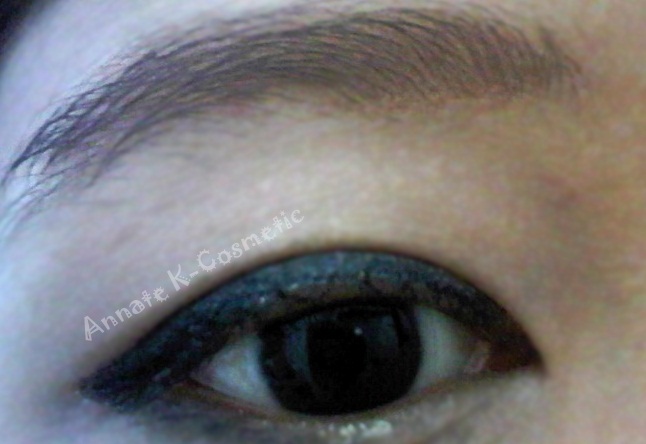 At the left, i appplied the eyeliner then splash it with water and wait for several seconds then i rubbed it. This eyeliner is still in good condition. The right pic is after i finished splash it with water and rubs several times. So, i can say this eyeliner is waterproof. 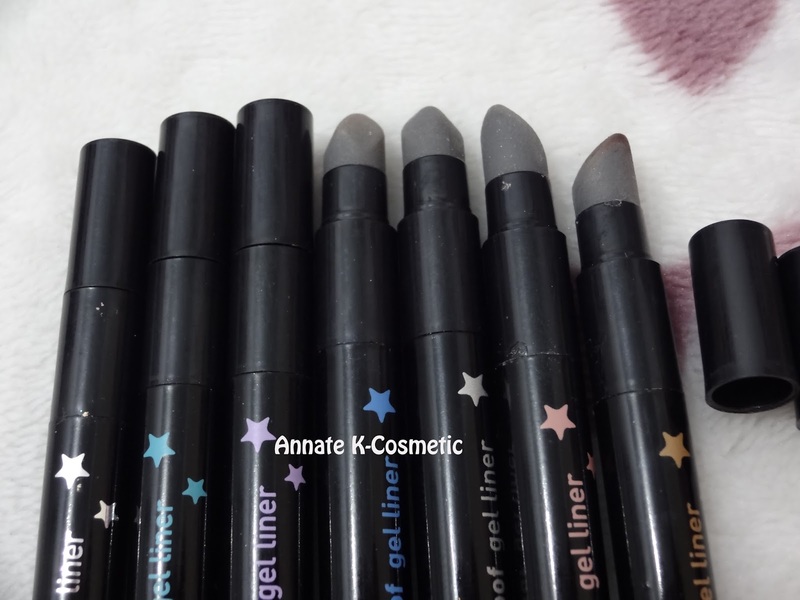 I use #01 Black Cat in my upperline and #08 Moon Silver in my waterline. I also use mascara from Innisfree : Soy Essence Waterproof Volume & Curling Mascara and Etude House Color My Brows #01 Rich Brown to my eyebrow). I'll review others color later.